DUMBARTON produced a good performance for the first 70 minutes away to Dundee in a Betfred League Cup group 'A' match, but then collapsed to a 6-2 defeat. Stevie Aitken's men responded well to poor displays against Forfar Athletic and East Fife, and matched their premier league hosts with some bright attacking play for the first 70 minutes. Soon after the kick-off tall Sons striker Robert Thomson burst through the defence and was manhandled to the ground. But referee Kevin Clancy waved away an early spot kick claim. On 15 minutes Dumbarton went behind to a soft goal bent into the far corner by Greg Stewart, after conceding a careless free kick on the edge of the penalty area. They equalised on 27 minutes, when Frazer Wright squeezed the ball in from close range following a corner for his first goal for Sons. Five minutes later it was 2-1 to Dumbarton. A Robert Thomson header crashed down from the crossbar and Gregor Buchanan struck the rebound into the the net. Sons looked eager again after the break, but it was Dundee who scored next when Kane Hemmings made it 2-2 with a shot from the edge of the area. 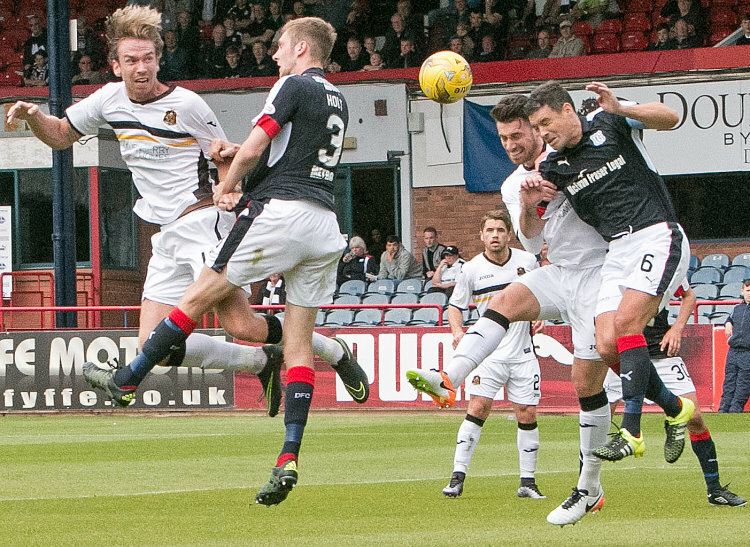 Two quick goals in succession from Dundee killed the game with just over 15 minutes to go. First Darren O'Dea headed home from a floating free kick, then Greg Stewart slotted home from 12 yards out. Stewart added a fifth goal with a smooth, close range slide-in on 78 minutes to complete a fine hat-trick, then Hemmings completed Sons misery as he burst through the defence to claim his second and Dundee's sixth just before the final whistle. The picture shows Robert Thomson heading for goal.